Advanced Pools, Inc. is a full swimming pool service & construction company. Our service specializes in pool repairs & pool renovations, which include pool re-surfacing (vinyl or plaster) retiling, adding steps & water features, as well as leak detection, custom concrete, and swim-outs. Our pool construction company department specializes in custom vinyl, gunite, and Trilogy Fiberglass shell construction. We use the latest technology coupled with innovation to provide you and your family the best in backyard fun. With your input and careful consideration we design the custom pool that best fits your wants and needs. 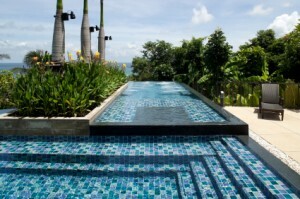 Custom pool doesn’t mean more expensive, but does mean most cost efficient. You pay for what you want, and get what you need.